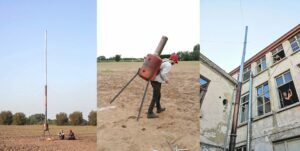 During Kunstenfestival Plan B in Bekegem, architect and artist Bert Villa became attracted to the concept of a chimney as our beacon of warmth and civilisation. Displayed in both rural Bekegem and Gouvernement’s urban courtyard in Ghent, the construction loses its original context and is open to new interpretations. The installation will be ignited once more. As Carbon hovers between destruction and creation, you are cordially invited to join the warmth of the installation before its removal. On Saturday, Carbon and the artist commence a one-day-long journey through the city, from Gouvernement in the heart of the city to 019’s building situated next to Dok Noord. There it embarks on a new journey, appropriating new contexts, meanings and interpretations. Bert Villa instinctively hides so-called facts and truths in favour of creating an alternative reality, often with a nod to technological progress. His practice is thus situated somewhere between architecture and visual art. Combining different disciplines and methods, he has worked out several projects for collectives and architectural offices such as 019 (Smoke & Dust), Cousée & Goris and the Berlin-based Constructlab. For the latter, he supported and developed the project The Arch, a self-developing structure acting as a summer hub for inhabitants, visitors, researchers and residents. Villa was also a resident, with Lydia Karagiannaki, at De Koer, as architect of the past, present and future. There is photographic proof of his walk on Saturday. Pictures taken by Pommelien Koolen, drawing by the artist himself. Carbon is temporarily on view until December 6. If desired, the installation can be seen during public events or on appointment with the artist. Many thanks to Bert Villa for the installation and to Kunstenfestival PLAN B for the context. We know you like to be up to date about this event, so go to the facebook event page for more.